With the New Year comes a whole new set of goals, or if you are like me, old goals you didn't quite meet in the previous year. High on the list of most of my friends is saving more money in the new year. 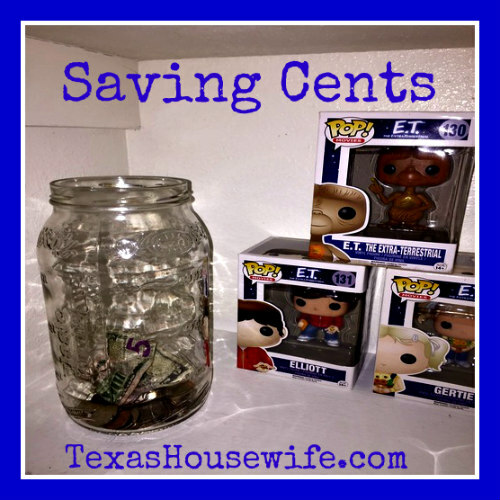 There are no shortage of suggested savings plans out there: the 52 week challenge, putting all your dimes away in a two liter bottle, squirreling away every five dollar bill that ends up in your hands. I have tried numerous savings methods over the years and none that I followed really worked for me. A few weeks would pass with me successfully saving, then something would derail me. Not dealing in cash, making very little money, unexpected emergencies, all those things and more would throw a hitch in my plans and my saving would stop or my stash of cash would have to be used for something. Many families are low income like we are and I am sure, also like me, think long term substantial saving is a near impossible goal. This way of thinking was getting me nowhere, so I decided to change things up in 2017. Enter my newest saving strategy, the pickle jar. This thing is big, a glass pickle jar I picked up months ago at a yard sale with the intention of using it as a kitchen utensil holder. The mouth of the jar was a little narrower than I needed for the purpose I intended, so it ended up sitting on the counter a few days. During that time something magical happened, loose change started to accumulate. It happened without much effort or thought on our part, we'd just empty our pockets into the jar before tossing clothes into the laundry hamper. Once money appeared in there, none of us touched it. In my case it started as a matter of curiosity, wanting to see how much could accumulate before life threw a curve-ball necessitating raiding our jar. There's no thinking about it, counting out a certain amount of money to hide away, which is why I think this works for us. The jar has moved from the counter to the bookcase, but location doesn't seem to have hindered our habit of tossing coins there daily. What's the point of this ramble about a change jar? Don't overthink it. Any savings is progress, even a small change can lead to a good habit. Don't stress that you aren't putting away $50 a week, especially if you truly cannot afford to do so. All you need to do is save SOMETHING. Change adds up and positive habits are positive habits despite the amount you sock away. Don't stress it, just do it. So far it's working for us.